On January 16, 1786, the Virginia General Assembly enacted the Virginia Statute for Religious Freedom. The Act, written by Thomas Jefferson (1743-1826), allowed Virginia to become the first state to separate church and state and remains part of Virginia's constitution. It was later used as a model for other state constitutions as well as the First Amendment to the U.S. Constitution. The Virginia Statute recognizes that because God had created freedom of thought the state should not attempt to "influence it by temporal punishment." It also prohibits the government from forcing people to "frequent or support any religious worship, place, or ministry whatsoever" and should not diminish the civil rights of people based on what they believe. Jefferson also recognized that someday people might want to change the law since nothing is irrevocable, but issued a warning that if future generations decided to repeal or circumscribe the act they would do so at their own peril because that would be an "infringement of natural right." "And though we well know that this assembly elected by the people for the ordinary purposes of legislation only, have no power to restrain the act of succeeding assemblies, constituted with powers equal to our own, and that therefore to declare this act to be irrevocable would be of no effect in law; yet we are free to declare, and do declare, that the rights hereby asserted are of the natural rights of mankind, and that if any act shall be hereafter passed to repeal the present, or to narrow its operation, such as would be an infringement of natural right." 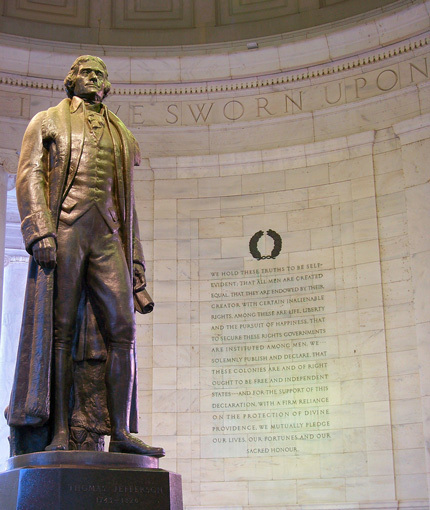 Jefferson believed that the Act was one of his chief accomplishments and he requested that his epitaph state, "Here was buried Thomas Jefferson, author of the Declaration of American Independence, of the Statute of Virginia for Religious Freedom and father of the University of Virginia."